LOFAR (LOw Frequency ARray) is a pan-European radio telescope designed to observe the radio universe at VHF frequencies. It is designed, built and operated by ASTRON, the Netherlands Foundation for Radio Astronomy. The LOFAR system is split across multiple sites — known as stations — each of which typically has two arrays of antennas. The antennas in each of these two arrays are different in design. One design is a vertical 'aerial' which stands about 1.8 m tall, optimised for radio frequencies in the range 30 to 80 MHz. The other design is a large 'tile', with a square area of 5 × 5 m. It is for the higher frequency range of 120 to 240 MHz. Did you note the gap from 80 to 120 MHz? LOFAR deliberately avoids these frequencies, as this is where commercial and public FM-radio stations broadcast. There is no point trying to listen for faint cosmic radio signals at the same frequency as a high-powered neighbouring radio station. 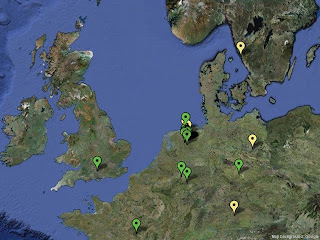 In addition to a large cluster of LOFAR stations in the Netherlands, there are additional participants in the main LOFAR project: Germany, France, Sweden and the United Kingdom. 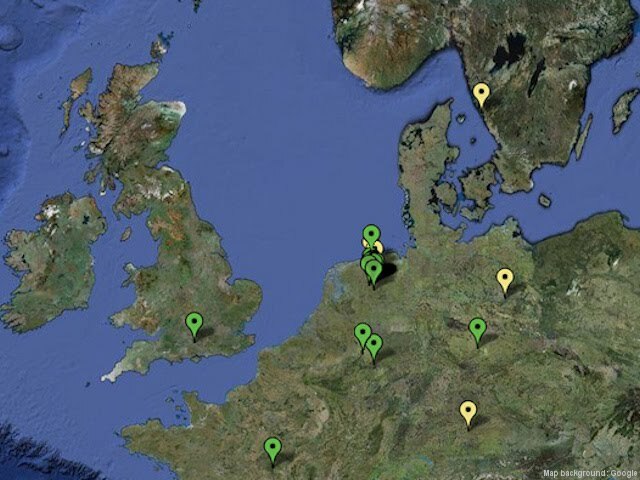 This map is a closer view than the one posted earlier, and shows the locations of the LOFAR stations (green = complete, yellow = under construction). KAIRA makes use of the same antenna technology that is used in LOFAR, making it compatible with the LOFAR system. This opens up some exciting prospects of linking the two projects. We'll be looking at these antenna systems soon. In addition, there have just been some important achievements by the LOFAR project. More on that in the next post!